For those who’ve got a knack for streaming videos, especially music videos, there comes a point where you wish you could download them all and only after downloading them, you realize that they occupy too much space. Your final option would be to figure out how to compress the files to save space. But here’s the kicker, the MP3 format, which is an audio coding format will do the trick. Since the MP3 format is a lossy data compression format, for digital audio, you will drastically reduce the size of the file, that is the video, to a very small size. Hence, this helps when you wish to store large amounts of data that can be compressed into the MP3 audio format. This also works on where you want to extract MP3 audio from videos. There are tonnes of video to MP3 converter apps that will effectively do this. This feature has narrowed down to the best and the highest ranked video converter to MP3 apps to help you not only download videos, but also convert them. The number one software for the job is Wondershare UniConverter (originally Wondershare Video Converter Ultimate). It has an eccentric design, intuitive user interface, very sturdy and exemplary performing. It expeditiously performs actions, whether converting or downloading and supports many different file formats. 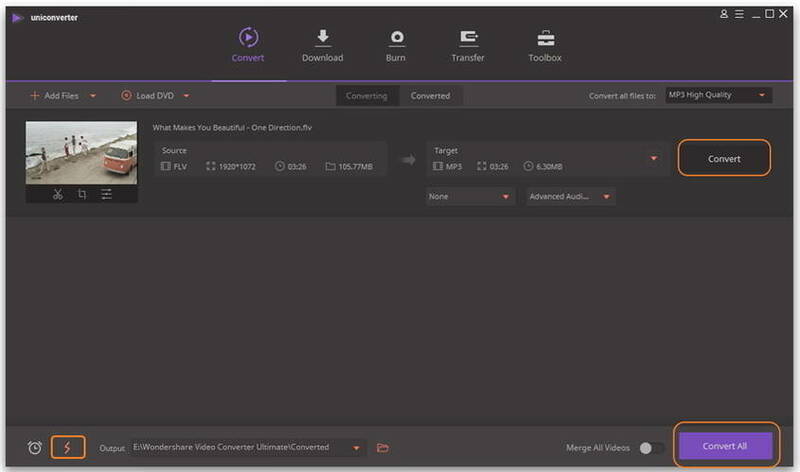 That is not all, YouTube MP3 video converter actions can be performed and this video to MP3 converter will definitely retain and offer high-resolution downloads and conversions. Best video to MP3 converter to convert videos to MP3 format or extract MP3 audio from videos. Support most media files formats including MP3/WAV/WMA/M4A/MP4/AVI/MOV/MKV/MPEG and more. Download YouTube videos by pasting URLs directly and other 10,000+ video sharing sites supported. Transfer videos to iPhone/iPad/iPod or Android devices easily via USB cable. Additional toolbox with functions of VR Convert, Fix Media Metadata, GIF Maker, Screen Recorder, etc. Once the software has been downloaded and installed, launch it and add files to start converting. To add files, click on the Add Files button on the main interface of the software as it is clearly visible. Then you can open the file browser and select desired videos. With the video files imported, click on the drop-down selection menu which next to the Convert all files to: button. With the formats displayed, click on the Audio tab and on the left-hand side of the displayed list, select MP3 option. You may proceed and select the resolution to High Quality on the right-hand side panel of the audio selection list displayed. Click on Convert or Convert All button to start the process. You can find the converted file under the Converted tab. You may as well select the folder-like icon to open the output folder location and find where it is stored. There are other video to MP3 converters free and online. These video to audio MP3 converter tools consists of online tools that are lightweight and can perform the job effectively. They are easy to use and also free online tools. They support many file format conversions and some have terrific conversion speeds. Below are some of these online tools and simple steps on how they convert. 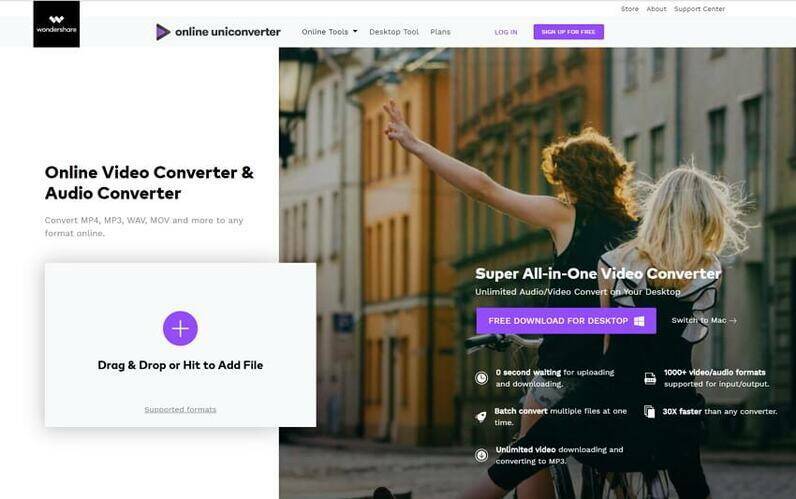 Online UniConverter (originally Media.io) is an online converter that has got a stunning interface. The site is attractive, thus making it very easy to use and understand. All elements are well displayed and organized. The site supports a maximum of two file conversions at a go. 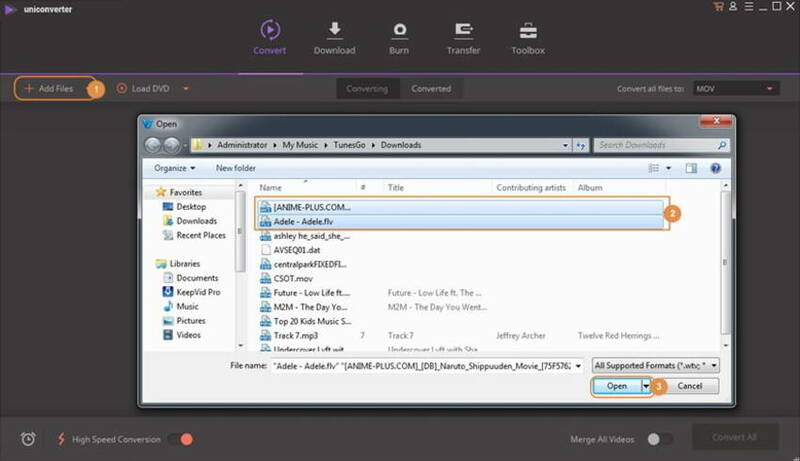 This video to MP3 converter online tool also supports many file format conversions, especially to many popular file formats. One minor downside is that the maximum upload file size for conversion is 100MB. Step 1: Start by visiting the site and click on the adding files section to insert the video files to convert. Step 2: The next step will be selecting the output format you wish to change the video to, in this case, we choose MP3. All these options are clearly displayed on the site. Step 3: Hit Convert to start the process. Wait for a while as the video converting process. Step 4: When the process is over, click on Download to get and save the converted videos as MP3. OnlineVideoConverter is another video converter to an MP3 online tool that is easy to use and is free too. The site is well laid out and figuring out how to convert files is very easy too. This is a good option as an MP3 video converter YouTube tools as the step below will clearly display. The upsides of the tool are that it is compatible with most web browsers, no registration is required, it supports link form most video sharing website, and there is no limitation on the conversions. Step 1: Find the video URL of the video you wish to convert, Copy and paste the link on the tool. Step 2: Select the output format as MP3 before starting the conversion. Step 3: When ready, click the Start button to start the conversion process. Step 4: Finally, when the conversion is over, download the converted video via the link provided. This online video to audio MP3 converter tool is simplified. It looks neat and thus is very easy to use. FLVTO can convert from many video streaming sites with ease. Besides supporting many browsers, it can also be used in many operating systems with ease. It has a section on how to guide one to use the tool too, this makes it easy to perform conversions when one gets stuck. Step 1: Locate a video URL of the video to be converted. Copy and paste it to the site. Step 2: Select the target file format output. This is the MP3 format. Step 3: Click on Convert to start the process and convert the video. Step 4: Once the conversion is through, download the converted file through the link provided. Online Video to MP3 converters are free and easy-to-use, it's your best choice if you only want to convert one or two videos to MP3, because almost all online converters has file size limitation. That's why we recommend you the desktop alternative for you, which has no limitation on file size and doesn't matter to your network situation. Here lists several shortcomings of the online video to MP3 converters. 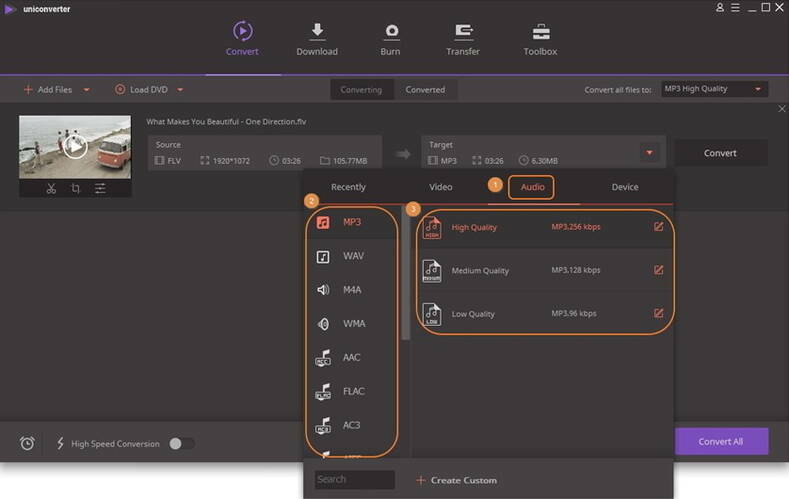 File Size Limitation: While most online video to MP3 converter tools can perform the job effectively, they either come with a file size limitation, such as having the maximum file upload size as 100MB, or they will not support batch conversion. Others may only support one conversion at a time. Network Connection: It is essential to have an Internet connection to use the video converter to MP3 online tools. The only limitation comes when they require a stronger Internet connection to perform the conversion. This is especially so, if converting large file sizes and for those supporting more than one conversion at a time too. Converting Speed: This limitation goes hand in hand with the Network Connection. The video to audio MP3 converter online tools may have this downside if the file sizes are too large or if the Network Connection is slow. Browsers and Streaming Sites: For the MP3 video converter YouTube and the likes that support converting videos using the link from the streaming site, there may come issues due to copyright and other infringement issues. This makes conversions of the videos from such sites difficult. Registration: Some online tools may have limited functionality unless one registers an account. Others may not even offer the service unless one register an account. The worst part is that some may require purchasing of a plan to continue enjoying the services or enjoy other benefits. As these limitations of online converters, you'd better choose a desktop video to MP3 converter if you have more files to convert. Wondershare UniConverter (originally Wondershare Video Converter Ultimate) is such a software program to help you convert videos to MP3 easily and quickly without any limitation. It supports batch conversion and many other media related functions, free download to have a try.